Once a required computer application in many cartography shops in the 1990s, Geocart has come back with a vengeance with Mapthematic’s 3.0 release (Mac and now Windows). While most GIS and remote sensing map software support a couple dozen obligatory projections, Geocart supports over 175 general case projections. Map projections are mathematical formulas for converting the earth’s round shape to a flat surface and their “parameters” can be adjusted to form thousands of specific projections. 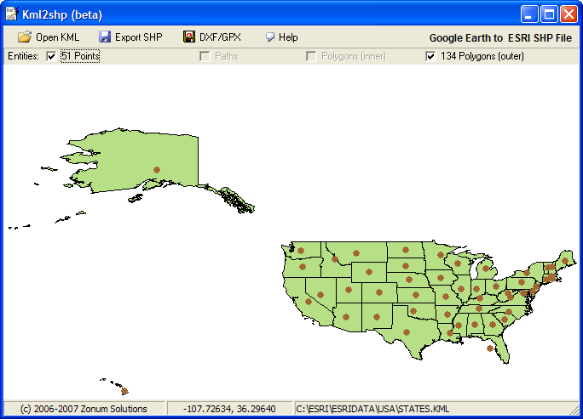 For comparison, ArcGIS, the popular commercial geographic information system software from E.S.R.I. supports 1/3 as many projections; MaPublisher from Avenza supports 1/2 as many as Geocart. The program’s author, daan Strebe, is a leading authority in this specialized subject and the new version incorporates corrections to many standard formula resulting in near loss-less projections. Unlike other software packages, Geocart can transform any projection to another projection (full forward and inverse transformation support for all projections). Other map applications can damage data when it is transformed. Furthermore, Geocart 3 introduces a new rendering mode using PixSlice technology to create a sharper, more detailed raster images (examples after the jump). This works both for resizing images and when transforming from one projection to another (reprojecting). The application manual includes a handy decision tree to assist in what projection to use depending on the map’s topic and geographic coverage. The application includes innovative advanced tools to visualize the distortion inherent in each projection (sample image). Pricing: For lapsed users, upgrade pricing is available for $500 with new professional licenses running $860, discount for multiple purchases. Steeply discounted non-commercial and student licenses are available. Price includes map databases (36GB with the pro version!) and, importantly, the new version imports shapefiles, the defacto geodata format. Full review continued below . . . I tested Geocart using the free, month-long trial (note the watermarks in the screenshots). Download and installation (once for the application, again for the default databases) went quickly but you will need an administrator account to accomplish the install. When the package downloads, it is labeled with your operating system type rather than “Geocart” so in my case I looked for “Mac OS 10.5/10.6″ in my downloads. The app and included databases each weigh in about 150 mb for 300 Mb of disk space. Rather than collecting associated database files in the Applications folder (Program Files on Windows), they are installed in Library > Application Support > Mapthematics > Databases. If you want quick “template” access to frequently used data, it should be added in that location. The “add recent databases” command partly makes up for this. To start mapping, go to File > New. Then go to Map > New. Multiple maps can be stored in a single Geocart document, each having their own projection parameters and database content. When making a map, the first step is to determine how large the map dimensions will be and how much geography it will show. The relationship between the two is called map scale. Some databases, like Natural Earth, are set up based on map scales. Using the right database will result in prettier maps that are generalized appropriately (the linework doesn’t look too detailed or too coarse) and smaller files that are easier to work with. Geocart also includes a useful linework simplification routine when your data is complex and needs to be simplified. This toggle is on by default and is accessed under Map > Generalize vectors. Toggle it on and off to compare the resulting resulting lines, your mileage will vary by map scale, even with the same source database. Tip: The application takes map scale seriously and includes a tool to calibrate your system under Preferences > Display. This calibration functionality is absent to most other mapping packages. Each new map starts with “Stylized World Topo 5400×2700″ raster image in layered with a vector grid (Map > Graticule) in sinusoidal projection. With the map selected, go to Map > Databases. I was able to easily add in shapefiles from Natural Earth, some of which are included in the default databases. If you have existing Geocart 2 format databases, those will import directly, including typesetting databases. Tip: To modify which databases load for each new map, go to Preferences > New Map Databases. I set mine to use Natural Earth country boundaries but removed the default image database. Have a scanned map without a projection? Geocart will help you figure it out. Add the map with File > Place image. (Vectors are not supported at this time). Then align with a map with a vector map database. Adjust the settings of the map until it matches. Then choose File > Export Database. Load the database back into a Geocart map and start projecting. I was also able to add several map images and quickly georeference them and then deproject to geographic (platte carrée) or into another projection. One was a simple map of the ash plume in Europe in Mercator. The other was a complicated world wall map from National Geographic in Winkle Tripel (examples below). Tip: When georeferencing an image, maximize both the map and the placed image to fit the window (Map > Scale to Window). Then adjust your Geocart map to use the same boundaries as the placed map image (make an educated guess). Then cycle thru the projections until the vector lines (graticule and country boundaries, etc) begin to match. Mercator and Robinson are common for world maps, a conic like Albers or Lambert is common for country and state maps. Then adjust the projection parameters and fine tune the boundaries and nominal scale and map resolution till everything fits exactly. Finally, export the placed image to database format. The familiar icons by projection class are still found in the main menu bar (see screenshot above). With a map selected on the document, choose a different projection (some are even listed in cyrilic and arabic!) and watch the map update in real time. If you want assistance in choosing a projection (who can remember all their quirks!? ), check out Projection > Change Projection. A dialog with the same listing comes up but with descriptions, history, preview maps, and distortion information. Gain insight with the programmer’s unique and comprehensive expert knowledge will help guide your projection choice. While the map is projecting, a progress wheel with a rough remaining time will show in the upper left corner. Advanced datum support and transformation are provided. Tip: The manual includes a full decision tree for choosing a projection. This is one of the best features of Geocart. I love interrupted projections like the Goode homolosine and making one in Geocart is a cinch. Simply choose the Goode from the Pseudocylindric menu (oval icon on left) and then chose Projection > Interruptions > Goode Continental. While you’re getting the projection parameters, map size and resolution right, keep the rendering quality at draft (Map > Draft). When the settings are right, change that to Map > Final Quality for more precise results. All databases in Geocart are geographic with live, on-the-fly transformations into your map’s specified projecting (see exception above for georeferenced images). I added in coastlines, rivers, lakes, country boundaries, US state boundaries into my test vector map. Even on my slowest, older laptop, rendering was responsive for basic usage creating vector world, regional, and country maps. Tip: When using a conic projection like Albers or Lambert, make sure the Projection > Projection Center is set to Latitudinal 0°N. Geocart 3.0 is a world unto itself, however. While it does import raw data in shapefile format (YES! ), it does not currently import or export PRJ files, part of the SHP file specification, the defacto geo data storage and exchange format. Imported SHP files must be in geographic projection. This makes sense in part as Geocart supports many more projections and parameters than most other mapping software packages (3 times as many as ArcMap, 6 times as many as Natural Scene Designer, 2 times as many as MaPublisher and Geographic Imager). Geocart also sometimes uses slightly different formulas for the same projections as the other applications (the author claims Geocart’s implementations fix errors in common formulas, which is probably the case based on my experience with the literature and web source code snippits). But for the projections that are shared in common, it would be useful to offer PRJ support (including transformations out of the error prone versions), and shapefile export of databases after their coordinates have been transformed (and GeoTIFF for raster). More importantly, PRJ files offer a quick load of common projection parameters. So if I’m in California I can load up the Albers with the standardized parameters so my data will interoperate with other cartographers working in that area, and they take some of the guess work out of choosing a map projection. Both ArcMap and MaPublisher are better then Geocart in this regard. MapTiler thru Proj4 is the worst. Azimuth (r.i.p.) is the best at setting appropriate projection and parameter for the visible, selected geography. Tip: If you do have a PRJ file, open it in a text editor and manually copy over the parameters to Geocart. They use a “well known text” structure that is human readable. Geocart includes basic legend editor for setting line and fill styles, appropriate for general reference mapping. 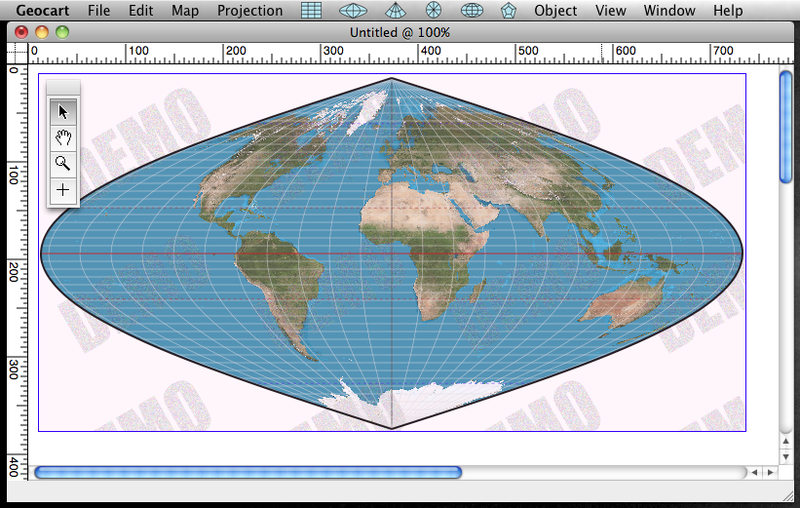 Geocart is a general projection tool, not for making thematic maps. The layer sorting of individual databases is adjustable in the Map > Databases dialog. 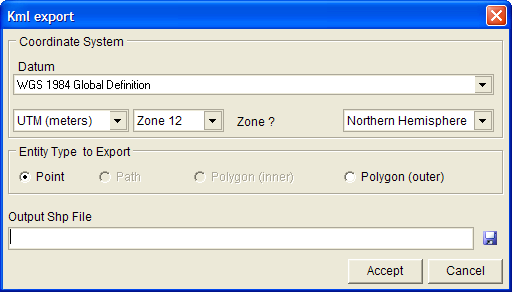 Tip: Consistent styles can be shared between map projects by going to Preferences > New Map Line Styles. Don’t want to plot the entire world? Use Map > Boundaries to set a crop (and speed up map rendering). This window is quite amazing and has both 2d and 3d views with actual spherical trapezoids! Boundaries can be set relative to the projection center and can be a circular diameter, spherical trapezoid, or irregularly shaped “custom” boundary. To remove the boundaries, change the setting back to “Unconstrained”. Quibble: When adjusting boundaries in most conic projection, your standard parallels should also change. A prompt should be provided in this use case to automatically adjust those to your new view. In the special case of setting standard parallels in Projection > Parameters, it would be helpful if Geocart showed these on a map like in the Projection Center dialog. Quibble: The draw on map interface in Boundaries needs a little more work for modifying the existing settings. Other apps, like Geographic Imager, allow me to drag the edges of a drawn boundary while in Geocart I have to start over (or use the number fields). It’s also a little wonky when dragging exactly horizontal or vertical (a full latitude or longitude strip). There are also no ticker buttons to increment the parameter values, either. Once you have this set, though, you’re golden so it’s a minor inconvenience. Next: Rendering quality and speed . . . Above: Brand X on the left. Geocart at right. Examine the letter forms (U in United Kingdom, N in London, all in Paris, the Ca in Cariff). The Geocart render results in sharper, crisper letter forms with less “pixel burrs”. The demo water mark not with standing. The key concept is Geocart creates an optimized map on each render. The original data resolution is stored in the document, but what draws on the screen is determined by the map size and resolution. Set that in Map > Set size and resolution. Once adjusted, the map will fill that space in the window. You can zoom in and out with the normal Cmd-+ and – keyboard shortcuts and the zoom with update in the window title. When Geocart is set to render in Final mode, its output results in better output than applications that use only nearest neighbor or bicubic interpolation. In the example above, looking at the letter edges on London, the Geocart version is crisper and smoother. This also comes into play at the edges of a world map where the projection distortion is more extreme and is especially important with projecting raster data. The map is in Winkel Tripel projection. I rasterized the PDF (took about 1 hour with Photoshop on my old laptop) and then loaded the image into Geocart and georeferenced it and saved it out as a database (78 mb, seems small), see section on Adding map data above. I then reprojected it Goode homolosine in Geocart. I also ripped out a platte carrée from Geocart and projected that into Goode in Geographic Imager, Natural Scene Designer, MapTiler (Proj4), and ArcMap. The final projected Goode image dimensions was 22,700 pixels by 9,910 at 675 mb in TIFF image format. Enough detail to print back out as a wall map or tile for a web map service. Paul Messmer’s under the hood improvements allow the application to make 100% use of all processor cores. I was still able to use other applications while Geocart processed data, however. One side effect of supporting multiple cores is rendering occurs per core in real time, see screenshot below. Geocart also plays nice on idle. I tested Geocart on 3 different machines, all Intel Macs running 10.5 or 10.6 from an older laptop to a new desktop towers. Application task completion speed increased directly proportional to the number of cores available. Fun fact: Geocart uses a Hilbert curve to render the map when utilizing multiple cores to keep memory accesses as local as possible in order to make the best use of the processor caches. This results in seperate render traces on the screen, see image below. At best “final” settings, the huge map in Goode homolosine projection described above took 20 min on the 16 core Mac Pro (2 x 2.93 quad core GHz quad-core Intel Xeon with 8 gb of RAM) but 1 hour 20 minutes on an older 4 core Mac Pro with the same RAM configuration. The draft render took significantly less time and was comparable in time and quality to Natural Scene Designer, Geographic Imager, ArcMap, and MapTiler (Proj4). Because Geocart is always planning for the most general case with the most advanced options, this can slow down it’s rendering compared to other applications (most noticeable when in Final rendering mode). Future versions might speed up if special functions were added for the standard parameter cases. But by the time the programmer did that, the speed difference might be equivalent to increases in hardware speed and cores, so this doesn’t worry me much. Geographic Imager ($699 for Adobe Photoshop plugin, add $699 if you don’t already own Photoshop) did not support the interrupted form of the projection and produced confetti until I tweeked the settings. To project vectors, you’d need MaPublisher, a vector plugin from Avenza for Adobe Illustrator, will set you back $1399 plus cost for Illustrator. ArcMap (thousands of dollars) required a RGB (not indexed) version of the geographic TIFF version but insisted on reprojecting into grayscale. Natural Scene Designer ($160) produced the most comparable raster results and ease of use, but at less quality (though faster). It should be noted the Pro version of Natural Scene Designer 5 also supports multiple cores and limited vector shapefile support (raster rendering only), plus better handling of GeoTIFF with TFW export. MapTiler, Mapnik, and other open source GIS options are free but you’ll spend time setting them up and learning their make-by-and-for-programmer quirks. Geocart is a good teaching tool as well when using the distortion visualizations and mouseOver readouts (available under Window > Information). The pertinent readouts are Angular deformation, Areal inflation, Scaler distortion, and Scale factor range. Note: Geocart quit on me once when I tried to use Map > Copy Attributes while visualizing distortion with a very large selected map, but I was not able to replicate the error or any crash in subsequent testing sessions. In general I’ve found the program to be very responsive and to not hang up, even when rendering extremely large maps with multiple databases. Quibble: The Information panel should display how long it took to render the selected map. On exporting out your final map, vector (PDF) and raster (TIFF, PSB “Photoshop”, and JPG) formats are available. On opening the map in Illustrator, each database layer is conveniently grouped, with clipped content. Geocart could take a page out of IndieMapper’s layered SVG approach where the file format would still be PDF but the groups would be named and even better yet actual PDF layers. Quibbles: Geocart suffers from the same zealous masking and embedding as other apps. If no boundaries have been defined in Geocart, the clipping masks should not be included. Saving out as PDF will embed the raster databases into the file, like all other programs. On export of the raster formats, an option should be provided to NOT export the vector database layers. Another option should be provided to export each raster database layer to a separate file (or layered TIFF / PSB). Needs to export out a PRJ file for the raster and GeoTIFF with embedded registration, pixel size, and projection tags. Note: If you’re looking for SHP export, you’ll be disappointed. Though that’s kind of missing the point of Geocart. See “Choose a projection” section above. Geocart 3 is a solid release that will satisfy most of your reference mapping needs, especially if projection matters to you. If you liked Geocart 2, you’ll definitely enjoy working with version 3, and on the latest computer hardware it simply screams. The addition of direct shapefile import removes a barrier to geodata access, though more could be made of the PRJ files and DBF attributes. There are still some missing features when compared to version 2 and daan (the programmer) is interested in hearing from the cartography community which should added back. They also seem responsive to fixing some of the usability issues I’ve noted above. Pros: Over 175 projections (best in industry), support for advanced projection parameters, loss-less reprojection, PixSlice technology for sharper, more detailed raster images. Runs on both Windows and Mac, with support for multiple core processors. Now imports shapefile vector map data. Large document support. Easy to use. Software programmer responsive to emails and forum posts. Cons: No PRJ support. Does not export GeoTIFF, or world file created after georeferencing images. Does not include a SHP filter in file dialogs, and file dialogs do not remember last browsed directory. Should start with blank new document on launch. Linework generalization engine filters just by Douglas-Peucker in this version, not the smooth bezier curves found in Geocart 2 or the amazing generalization found at MapShaper.org. Rendering in PixSlice can significantly increase render times. No support for scripting/automation. No export back to SHP format (especially with DBF attributes), useful for thematic mapping in a secondary GIS application. All this talk of Rich Internet Applications and choosing if one should use Flash, Silverlight, or some Googley “open source” solution can leave the head spinning. Most often it is best just to get the job done with the tools and skill set at hand. But what does the future hold? Several clues are at hand, revealed at last week’s Apple developers conference in San Francisco. Why SproutCore? It is being used to deploy Apple’s own Cocoa programming frameworks from the Mac (that’s what gives the Mac it’s look-and-feel) onto the web as open standards that will enable “desktop” like applications (in their look and power) to run in your web browser. And on your Windows PC, to boot. Talk about an end-game run around! Read more on this topic at AppleInsider.com and RoughlyDrafted.com.